Canon has announced its Rebel SL3 featuring 4K video and Dual Pixel CMOS AF with Eye Detection AF in Live View shooting mode. The SL3 is also the lightest and smallest camera in the EOS lineup, the company said. "Since its inception, the EOS Rebel product line has aimed to provide imaging excellence for entry-level visual storytellers," said Kazuto Ogawa, president and chief operating officer, Canon U.S.A., Inc. "Therefore, it was imperative that the next step in the EOS Rebel journey include innovative features such as 4K video and DIGIC 8 Image Processor to meet the needs of emerging photographers, while living up to the high-image quality and compact size EOS Rebel dSLRs are known for." The Rebel SL3 matches a 24.1-megapixel 1.6x APS-C CMOS sensor to a DIGIC 8 processor first introduced in the EOS M50 and used in the EOS R full-frame mirrorless system. DIGIC 8 helps improve autofocus performance and allows for the processing of 4K video and 4K time-lapse movies, the company said. Autofocus relies on nine AF points across the optical viewfinder and includes a new Spot AF which allows you to focus on a precise area within the subject. 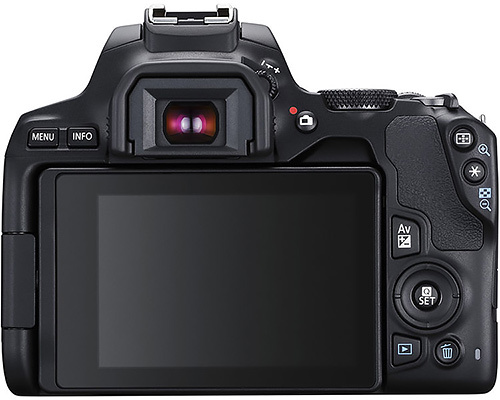 The Rebel SL3 is Canon's first dSLR to feature Dual Pixel CMOS AF with Eye Detection AF in Live View shooting mode. The system is also the first Canon EOS SLR to incorporate a Smooth Skin setting to help render skin tones, as well as Creative Assist, an interface to check and change shooting conditions in Live View with real time feedback. The Rebel SL3, which relies on lens-based image stabilization like its predecessors, spots a 5.0 frames per second continuous mode and digital lens optimization to correct optical shifting in camera. Adorama and B&H are both now accepting pre-orders. 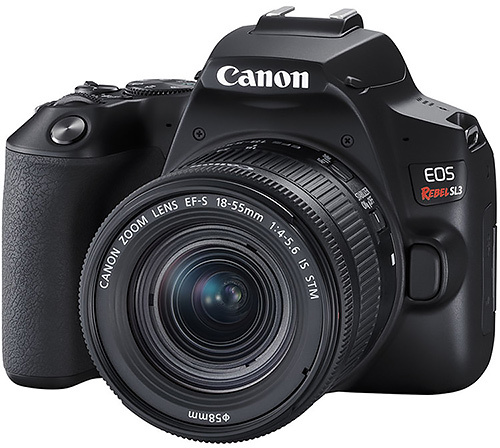 MELVILLE, N.Y. -- Combining ease-of-use with high-image quality, Canon U.S.A., Inc., a leader in digital imaging solutions, today unveiled the EOS Rebel SL3 dSLR camera, the smallest and lightest product within the current EOS lineup. Weighing just 15.84 oz., the EOS Rebel SL3 offers users a compact system delivering high-resolution images -- complete with an APS-C imaging sensor, DIGIC 8 Image Processor and 3.0-inch vari-angle LCD touchscreen as well as 4K video, a first for the EOS Rebel lineup. 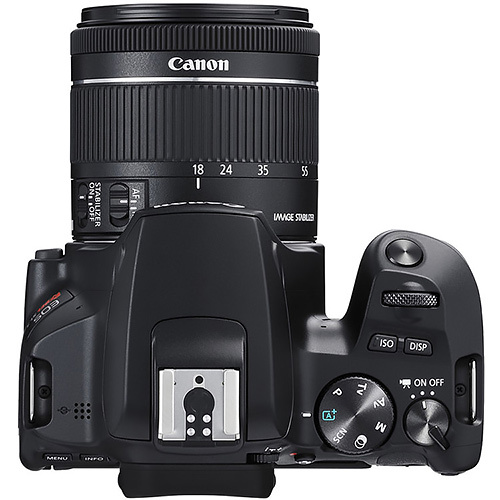 Compatible with Canon's full line of interchangeable EF and EF-S lenses, along with the ability to instantly send images to compatible smartphones through Auto Image Transfer via WiFi connectivity, the EOS Rebel SL3 is the tool needed to empower aspiring photographers to capture gorgeous shots quickly and easily. The EOS Rebel SL3 carries a powerful 24.1-megapixel CMOS (APS-C) sensor, enabling users to snap photos and express themselves across a multitude of settings -- whether it be a beautiful night scene, stunning family-vacation destination or a picturesque landscape. The camera is equipped with Canon's DIGIC 8 processor -- first introduced in the EOS M50 and later built into the revolutionary EOS R full-frame mirrorless system. DIGIC 8 helps improve autofocus performance and allows for the processing of 4K video and 4K time-lapse movies -- helping budding videographers record scenes such as the colorful evening skyline in brilliant detail. The EOS Rebel SL3 features autofocus capabilities, delivering nine AF points across the optical viewfinder. This includes a new Spot AF which allows users to focus on a precise area within the subject. The EOS Rebel SL3 is the first dSLR in the Canon EOS line to feature Dual Pixel CMOS AF with Eye Detection AF in Live View shooting mode. With its optical viewfinder and Live View LCD monitor, photographers can enjoy two different ways of shooting and customize their experience based on the scene. The system is also the first Canon EOS SLR to incorporate a Smooth Skin setting, which can help render skin tones as well as Creative Assist -- an interface by which users can check and seamlessly change shooting conditions in Live View -- such as white balance or brightness -- in real time. The EOS Rebel SL3 will be available toward the end of April for purchase in black and white color options for an estimated retail price of $599.99, for the body only and $749.99 for the body with a EF-S 18-55 f4-5.6 IS STM lens. For more information, visit http://usa.canon.com.